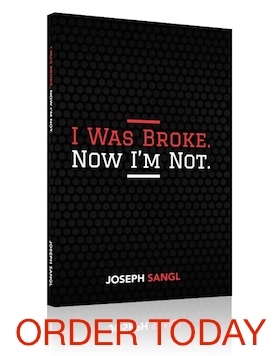 You may remember reading a few weeks ago that www.JosephSangl.com will be featuring inspiring stories of people who are marching their way out of debt. Today, www.JosephSangl.com welcomes the first couple. This first couple has HAD IT with debt and are just starting out on their path toward Debt Freedom! This couple has been married for many years and have two children. Here is what their Debt Freedom Date Calculation looks like. Just the very act of looking where every single penny comes and goes is beneficial. We are pumped about doing this for our family.We are using cash envelopes for groceries and implementing the budget. I am in one of those months where money is tight because I have not planned ahead. I am cutting spending by carving some fat out of the things we thought we needed but really don't. I am setting aside money in an ING savings account for the escrow fund. I am getting to my 2500 emergency fund ASAP. I am then going to whale away at the debt. This is the FIRST MONTH that couple #1 has a detailed plan for every single dollar they earn. INCOME – OUTGO = EXACTLY ZERO!!! Couple #1 – I am proud of you, and I can't WAIT to celebrate your achievement of securing Debt Freedom! The AWESOME thing is that TWO of your debts will be leaving THIS MONTH!!!! Next month, you will be able to apply those payments to the Wells Fargo Credit Card! Readers – Would you write some notes of encouragement for this couple as they step out of debt together? This is so awesome. You guys are going to make it. Just keep plugging away. I am inspired!!! Making the turn and deciding to take action is the hardest part…you’re off to a great start. I am praying that you will continue attacking your debt and eventually KILL IT FOREVER!!!! Imagine what the Lord will be able to do through you when you are debt free…OH YES!!!! We are now into our 3rd month of budgeting and envelopes. It does get easier to discipline yourself with each passing week. The #1 thing that has helped us is not going to the Mall at all and not even Lowes or Walmart unless there is a specific item NEEDED and it is written on a list and I have the exact amount of cash needed and NO plastic in my pocket. It’s amazing what you can do without when you THINK before you head out! Even the grocery issue has gotten better, using a list and cash and doing without what is not necessary. Keep on keepin on, you can do it!!! couple number one rockin’ the debt ball!!! woooo! i’ll admit, i’m kinda jealous. my wife and i just got to a point where we paid off a bunch of credit cards and called to close those accounts and it felt soooo goooood that i wish i could do it all over again! but, instead of doing that again, i’ll just praise God that you are getting that snowball rolling and will have that huge sigh of relief in no time! congratulations on taking that giant first step. i’ll be praying for you. and thanks to mr. sangl for helping couple number one and for writing a blog for people like me. i hope you make it to couple number 1,000,000! Picking up an extra job can always expedite the process. My husband and I are working our way through our first month of spending our money on paper before we actually get it, and even though we’ve had to cut our spending, there’s so much freedom in this!! I don’t worry about the account balance anymore because I already know what it will be. I don’t feel guilty after spending a chunk of change on groceries because I know I spent what I had already planned to spend. I hope you guys are feeling as encouraged as we are! You may remember reading a few weeks ago that http://www.JosephSangl.com will be featuring inspiring stories of people who are marching their way out of debt. Today, http://www.JosephSangl.com welcomes the first couple. Wow, sounds like you guys are on the way to debt freedom. I’m proud of you, keep up the good work. Trying to figure out my debt on paper now. You are inspiring! If y’all get there before we do, invite us to the party!! You can all come to mine…but it will be a while 🙁 ! !